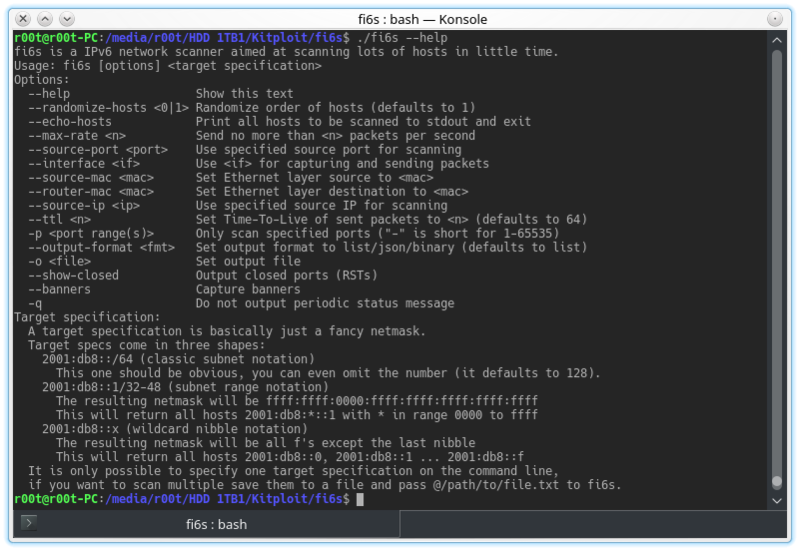 fi6s is a IPv6 port scanner designed to be fast. This is achieved by sending and processing raw packets asynchronously. The design and goal is pretty similar to Masscan, though it is not as full-featured yet. Building should be fairly easy on up-to-date distros. The scanner executable will be ready in at ./fi6s. Note that fi6s is developed solely on Linux, thus it probably won't compile on non-Linux OSs (notably Windows). Usage is pretty easy, fi6s will try to auto-detect the dirty technical details (source/dest MAC, source IP). There are more different ways of specifying an address range to scan, if you aren't sure what's about to happen invoke fi6s with --echo-hosts and it will print every host that would've been scanned. For advanced features please consult the output of ./fi6s -h.
Since fi6s has its own TCP stack, the OS stack needs to disabled to avoid interference with banner grabbing (RST packets). This is most easily done using ip6tables and a constant --source-port.